Founded in 1912, EAST TEXAS BAPTIsT UNIVERSITY is located in Marshall, Texas, a historic city of 25,000 nestled in the scenic piney woods of East Texas. It is part of a larger metropolitan area of Longview, Texas, and Shreveport, Louisiana, and is located 150 miles east of Dallas, on Interstate 20. Marshall is in the center of a recreational and tourist region, and is near the Caddo Lake recreational area. 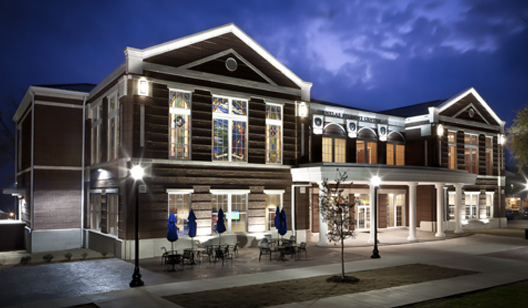 ETBU provides academic excellence while integrating faith with learning. There are over 40 programs of study, with several courses offered through travel study which provides students the opportunity to see the world while completing their education. ETBU also offers 4 areas of Masters level study in Education, Religion, Business, and Counseling. More than 85% of faculty members have the highest possible degree in their field. Excellent facilities and quality staff round out a complete commitment to provide a campus culture and experience that will help students prepare for life and their career. Students will find an incredible campus community at ETBU. About 85% of students live on campus and participate in numerous clubs and organizations. A vibrant campus life filled with student activities and intramural sports provide students the ability to gain important leadership skills that are vital to success in life. China - ETBU is concluding her 20th year of relationship with the Guangdong Teachers College of Foreign Languages and Arts (GDTCFLA) located south of Guangzhou, China. In 20 years the two universities have exchanged 11 delegations, 27 semester or year-long teachers, and a good number of students. In the upcoming year two more teachers will travel to ETBU to further develop and teach Chinese language and culture courses. In the spring President Fang made his first visit to the ETBU campus to sign a new articulation agreement between the schools. Fang is the third GDTCFLA president to visit ETBU. 16 Chinese students are applying to transfer to ETBU through the new agreement. Later this summer ETBU will host a delegation of students, faculty and administrators from the Ningde Teachers College (NTC) located in Fujian Province. This is a follow-up visit building on the semester-long stay of Joseph Gong, Dean of the NTC English Department, at ETBU earlier this year. ETBU and NTC will explore the possibility of developing a 2+3 program whereby NTC graduates may complete undergraduate degrees at ETBU in three years. ETBU continues its three-year relationship with the Lanzhou University of Technology (LUT), located in Gansu Province in northwest China. Two students and one teacher from LUT will study and teach on the ETBU campus in the fall semester. One or two additional teachers will join the group in spring, 2007. Last semester LUT teachers provided tai chi and martial arts classes at ETBU. ETBU President and Mrs. Bob Riley, accompanied by Dr. and Mrs. Paul Sorrels, Provost and Academic Vice President, will travel to Poland as guests of the Jan Dlugosz University (JDU) in Czestochowa. This is a reciprocal visit, following a Texas whirlwind tour of a group led by Prof. Janusz Berdowski, Rector of Jan Dlugosz University, and hosted by Dr. Paul Sorrels in April of this year. Later in the year two exchange students, one from each university, will travel to study biology at ETBU and Polish language at JDU. ETBU students and teachers will travel to Oaxaca, Mexico to study Spanish at three levels for four weeks in July. Students will accomplish service and language objectives by working with local children.